Three men were sentenced to be guillotined in the French revolution, a priest, a muslim, and an engineer. The priest was first: he looked toward Heaven where his God and Creator were. The blade fell, but juddered to a halt an inch above his neck. Amazed, the executioners declared a miracle so the priest's life was spared. The Muslim was next: he looked toward Allah in the East. Once again, the blade shot down and stopped an inch from his neck, and once again a miracle was declared and the Muslim was also set free. The engineer was last. He laid on the guillotine facing upwards. The order was given to drop the blade but he shouted out, "Hang on a minute. I think I have found what the problem is: you see that small bolt. Well it is sticking out too far and that is jamming the bla…"
A mathematician and an engineer agree to a psychological experiment. The mathematician is taken to a large room with a beautiful naked female laying on a chaise lounge in one corner and a chair in the opposite corner. The psychologist says, "She is yours, but the only catch is that you must sit in the chair and every five minutes, I will move the chair to a position halfway between its current position and the chaise lounge." The psychologist emphasises, "You are to remain in your chair." The mathematician looks at the psychologist quizzically. "What? I'm not going to go waste my time. You know and I know that I'll never reach the chaise lounge!" The mathematician then marches out. The psychologist makes a note on his clipboard and ushers the engineer in. He explains the situation, and the engineer's eyes light up and he has a broad smile on his face. The psychologist is confused. "Surely, being a technical man, you must know that you will never reach the lady?" The engineer's smile broadens, "Of course! But I'll get close enough!" An artist, an architect, and an engineer are in a bar discussing the merits of mistresses and wives over a beer. The artists says, "I would much rather have my mistress! She is more enthusiastic and inventive, and I like the thrill and risk." The architect says, "I much prefer my wife for her consideration, stability and reliability." 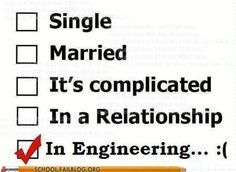 The engineer says, "I like to have both; that way, my wife thinks I'm with my mistress, and my mistress thinks I'm with my wife. Meanwhile I can sneak back to work and finish my project!" One day Indias invented world smallest, thinest metal thread and send to China with a letter. " We make world smallest, thinest metal thread. please check this and you want more, infrom us." After a month, the item will return. India check the metal thread. They dont see anything note more in the pack. India called to china and asked. "Why you resend the item to India? You dont want this ?" " Please check the item little bit more. We are drilled through your material and we will fiiled with our new thread in your meterial...."
Two people got into an argument in a restaurant. One throws the cheddar cheese. The other one says "Oh THAT's mature". To an optimist, the glass is half-full. To a pessimist, the glass is half-empty. To an engineer, the glass is twice as big as it needs to be. Cedric, an engineer, is cruising the South Pacific, but, a cyclone springs up and sinks the ship. He is swept ashore: no one else, no food, no supplies, nothing. He searches the island but only finds bananas and coconuts. For the next three months he is lonely and forlorn. He eats bananas, drinks coconut juice and longs for a ship to rescue him. One day, he spots a rude boat coming from another island. On it is a pretty young woman. She is slim and tanned, and her hair flows in the sea breeze. He runs up to greet her on the beach. He asks excitedly, "Where you on the cruise ship?" "Yes!" she replies. "I was washed up on the other island. I built the boat from palm leaves. I whittled the oars from cedar wood. By the way I'm Susan." "But--but," askes Cedric, "What did you use for tools?" "Oh, no problem," she replies, "On the south side of the island there is a stratum of alluvial rock. I found that if I fired it with charcoal in my kiln, it melted to form iron." "But enough of that," she says. "Where do you live?" Cedric confesses that he had been sleeping on the beach. "Let's row over to my place," she says. So they sit on the boat and Susan rows to her island. She ties the boat to a small jetty with a hemp rope. They walk up a cobbled path to a little bungalow. "It's not much," she says, "but I call it home. Would you like a drink?" "No," Cedric answers, "One more drop of coconut juice and I will puke." "I have a still," she says, "How about a Pina Colada?" Trying to hide his amazement, Cedric accepts, and they sit together on a couch of seagull feathers. Susan says, "Have you always had that beard and mustache?" "No," Cedric replies, "I was always clean shaven." "Well, if you would like to shave, and freshen up you are welcome to use the bathroom." Cedric, even more amazed, opens the bathroom door. In a cabinet is a razor with a bone handle clamping an oyster shell honed to a razor edge. After shaving and showering he returns to the sofa with Susan. "You look great," she says. "I think I will slip into something more comfortable." Ten minutes later, Susan returns in a couple of banana leaves and the scent of gardenia. She asks, "Have you been lonely? Is there anything that you miss? Something that all men and women crave? Something that would be really nice to have right now?" "Yes, there certainly is," Cedric replies, and moves closer to her. "Tell me, do you have an Internet connection?" God is furious. In a roll of thunder he elevates to Heaven three influential humans: The Pope, Vladimir Putin, and Bill Gates. "The human race is a complete disappointment to me," God boomed. "You each have one week to prepare your groups for the end of the world." With another crash of thunder the three arrive back on Earth. The Pope addresses his flock. "I have good news and bad news," he announced grimly. "The good news is that we will all be meeting our maker. The bad news is, God is displeased and will end the world in a week." Putin in Russia announces to the Federal Assembly: "Comrades, I have bad news and even worse news. The bad news is that we were wrong; there is a God. The worse news is God is really annoyed with us and is going to end the world in a week." Meanwhile, Bill Gates calls a meeting of his top engineers. "I have good news and great news. The good news is that God considers me to be one of the three most important men on Earth. "The great news," he beamed, "is that we won't have to fix Windows Ten after all." I can't resist. Sorry it is a link to an outside site. But I love the content. On the first day, she sadly packed her belongings into boxes, crates and suitcases. On the third day, she sat down for the last time at their beautiful dining-room table, by candle-light; she put on some soft background music, and feasted on a pound of shrimp, a jar of caviar and a bottle of spring-water. When she'd finished, she went into each and every room and deposited a few half-eaten shrimps dipped in caviar into the hollow center of the curtain rods. On the fourth day, the husband came back with his new girlfriend, and at first all was bliss. Then, slowly, the house began to smell. They tried everything; cleaning, mopping, and airing-out the place. the two had to move out for a few days, and in the end they even paid to replace the expensive wool carpeting. Nothing worked! Then the ex-wife called the man and asked how things were going. He told her the saga of the rotting house. She listened politely and said that she missed her old home terribly and would be willing to reduce her divorce settlement in exchange for having the house. Knowing she could have no idea how bad the smell really was, he agreed on a price that was only 1/10th of what the house had been worth... but only if she would sign the papers that very day. She agreed, and within two hours his lawyers delivered the completed paperwork. ... and to spite the ex-wife, they even took the curtain rods! I wondered where that one was going. A blonde is standing in front of a soda machine at the casino. She puts in a dollar and gets a Coke. She puts in another dollar and gets a second Coke. She contemplates the wad of ones in her hand and after a moment puts in a third dollar and gets a third Coke. The guy in line behind her asks, "Hey lady, you almost done so someone else can use the machine?" The blonde rounds on him abruptly and says, "Back off, [expletive deleted]! Can't you see I'm winning?!" they fell asleep, not waking until 8 o'clock. They got dressed quickly. the lawn. Bewildered, she did as he asked thinking him pretty weird. afternoon making love, and then fell asleep. That's why I'm late." those are grass stains on your shoes. YOU DAMN LIAR! You've been playing golf again, haven't you?" Four guys have been going on the same golfing trip to St.Andrews for many years. Two days before the group is to leave, Jack's wife puts her foot down and tells him he isn't going. Jack's mates are very upset that he can't go, but what can they do. Two days later the three get to St. Andrews only to find Jack sitting at the bar with four drinks set up! "Wow, Jack, how long you been here, and how did you talk your wife into letting you go?" "Well, I've been here since last night. Yesterday, I was sitting in my living room chair and my wife came up behind me and put her hands over my eyes and asked, 'Guess who?' I pulled her hands off and there she was, wearing a nightie. She took my hand and pulled me into our bedroom. The room had candles and rose petals all over. Well, she's been reading '50 Shades of Grey'! On the bed she had handcuffs and ropes! She told me to tie her up and cuff her to the bed, so I did. And then she said, "Do whatever you want." On my first trip to Atlantic City, after putting quarters in slot machines all day, I was down a few hundred dollars. On the way out, it made my day when I won at the Coke machine. New to gambling, they asked a fellow patron "Where does the money come out"? He pointed to the ATM (Automatic Teller Machine).